Cities can transform from black holes sucking in food, energy, and other resources to engines of a regenerative food system and bioeconomy. The transition to a circular economy will see production which regenerates rather than harms the natural systems upon which it relies, food waste designed out, and food by-products used at their highest values. Food comes from natural systems which are inherently regenerative. 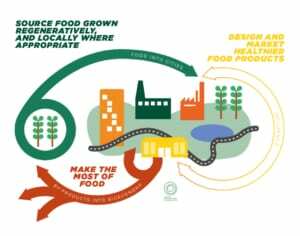 Replicating these practices will improve the overall health of local ecosystems, diversify the food supply to increase resilience, reduce packaging needs, and shorten supply chains. Urban and peri-urban farming will see connections strengthened with food and the farmers who grow it. Cities play a crucial role in keeping food at its highest value and eliminating waste. They can become hubs for the redistribution of surplus foods and a thriving bioeconomy where food by-products are transformed into organic fertilisers, biomaterials, medicines, and bioenergy. There are no healthy food choices in an unhealthy food system. We can change food design and marketing to reshape our preferences and habits. This will ensure that healthy products become easily accessible, while valuable nutrients circulate back to the soil safely.. Source: The report has been produced as part of Project Mainstream, a CEO-led global initiative created by the Ellen MacArthur Foundation and the World Economic Forum, which helps to scale business driven circular economy innovations.